with comfort ride & long life in FALKEN Brand. Azenis PT722 is Falken’s first Touring, all-season tyre, with a deep tread depth and long lateral groove, for anti-hydroplaning and stability in the wet. the asymmetric tread pattern provides tremendous comfort while Falken’s Rotation Wear Indicators regularly inform drivers of proper rotation timing, thus maximizing wear performance for better mileage and longer life. Azenis PT722 is Falken's first Touring, all-season tyre, with a deep tread depth and long lateral groove, for anti-hydroplaning and stability in the wet. the asymmetric tread pattern provides tremendous comfort while Falken's Rotation Wear Indicators regularly inform drivers of proper rotation timing, thus maximizing wear performance for better mileage and longer life. The first 'Premium Touring Tyre' with comfort ride & long life in FALKEN Brand Azenis PT722 is Falken's first Touring, all-season tyre, with a deep tread depth and long lateral groove, for anti-hydroplaning and stability in the wet. 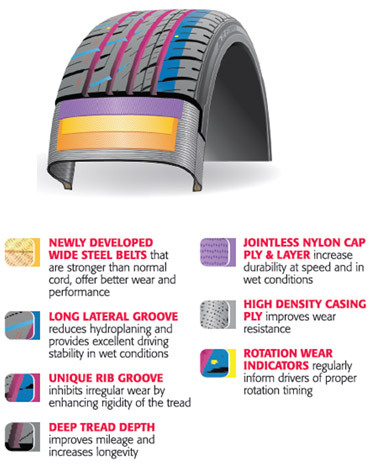 the asymmetric tread pattern provides tremendous comfort while Falken's Rotation Wear Indicators regularly inform drivers of proper rotation timing, thus maximizing wear performance for better mileage and longer life.